A couple of weekends ago, I found myself on an unexpected flight back from Minnesota. I had taken my laptop along in lieu of other entertainment, intending to get a lot of work done, but on the last leg of my journey, I just wasn’t feeling it. So, I started wandering around the Charlotte, NC airport looking for reading material. It took no fewer than three bookstores for me to find one with a selection that included anything other than Danielle Steele, Nicholas Sparks, and James Patterson, but I did finally come across a book that I had been planning to read for a few months: Devil in the White City. I finally wrapped up the book last night, so here is my quick and dirty review. This book is really well written as a novelized history, and the beginning and middle of the book were enthralling–I couldn’t put it down. However, the tail end disappointed me slightly, because I felt that Erik Larson, the author, had been teasing a much grander climax than apparently the historical record could support. When I say that the book is about the Chicago World’s Fair of 1893, I do mean that the book is actually about the fair. It tells the story of the great minds who planned the fair–from Daniel Burnham, the supervising architect and the man in charge, to Frederick Law Olmsted, the landscape architect who designed the sweeping lawns of the fair, the water canals, and the island that captured visitors’ imaginations, and everyone in between. Although at the beginning, I will admit that I was more excited by the story of H. H. Holmes, one of the aliases of Herman Mudgett, and his “killing castle,” a building in which he lured perhaps dozens of women (and maybe men!) and killed them at his leisure, after just a couple of chapters about the World Fair itself, I found myself less interested in the murders and more interested in the incredibly difficult and complex problems of the Fair. The deeper in the book I got, the more I realized that the “devil” was not necessarily just Holmes, even if he were the most obvious filler of that role. The “devil” could also have been the heavy rains that threatened to ruin the white paint and the carefully prepared landscaping, or the exhaustion that plagued many of the artists on the project. The “devil” could even have been the City itself, considering the havoc it wreaked on the lives of the men who raised it. 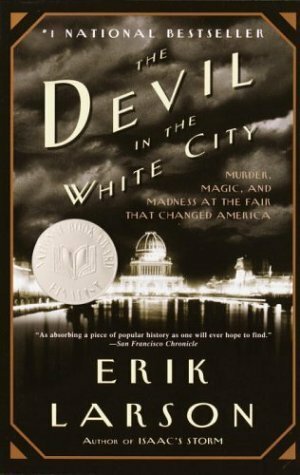 Recently a movie based on Devil in the White City was announced, with Leonardo DiCaprio in the role of H. H. Holmes and Martin Scorsese directing. To be completely honest, I had no idea that a movie was in the works when I picked up the book, and I am a little disappointed that someone is planning to make a movie based on this book. Most likely this movie will be almost entirely about Holmes and his titillating drama and nearly ignore many of the grand dramas of the City itself, since those likely will not translate to film well. The movie should, in my opinion, just give itself another name and claim to be based on the life of Holmes, rather than call itself after this book. I felt as though Larson’s description of Holmes’s activities as the Fair was being built were leading up to something much larger and uglier. Don’t get me wrong, some of the descriptions of things he did to his victims was stomach turning–not the least of which was, in some cases, winning their trust and love before murdering them–but it all felt like it was a prologue. That even worse things were right around the corner. The ending to that story line felt rushed and incomplete. The end of the story of the White City was a little less rushed, but still did not feel finished by the end of the book. The prologue, describing an evening toward the end of Daniel Burnham’s life begged a bookending epilogue in the same style, but there was not one. Because of this late disappointment, I have to give Devil in the White City four Death Stars out of five.